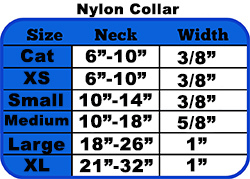 This nylon collar is available in our full range of widths. These American made collars are made with military grade hardware and are held to the highest standards of quality and durability. See Size Chart Below.